In this section, I’ll be helping you in making some fundamental decisions, as well as choosing and setting up some key services. 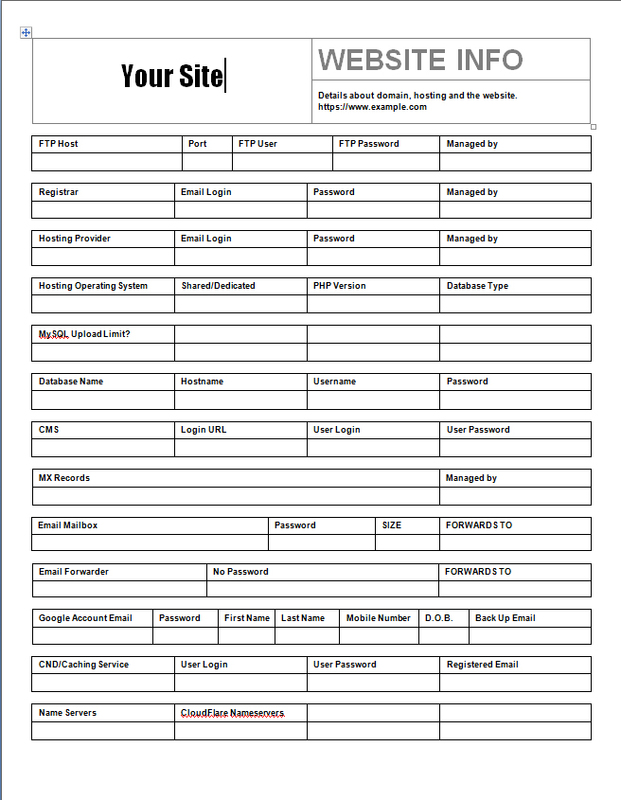 For the sake of everything going smoothly, let’s use a document like this one (it’s a Microsoft Word Doc) to keep usernames and passwords organised. I’ll administrate the document, for the most part, asking you for credentials over the phone or in person and entering them into the document. Consider using a strong password generator to create passwords. 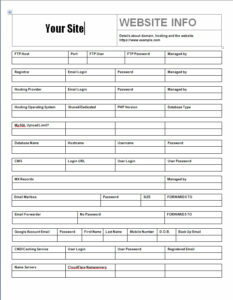 The passwords will be copied and pasted into your credentials document. The document will be password-protected and stored on a USB device that I will give to you. It will also be added to a Google Drive folder that we can both access and edit. If the passwords change, the copy of the document on the USB stick would need to be updated. If you want to send usernames/passwords by email, don’t ever paste the password as plain text into an email. Instead, use QuickForget.com. Do you have a Gmail address? Then you have a Google account. It includes many free tools and services including Google My Business, Google Drive, Google Analytics and Google Search Console. If you don’t have one, please set one up now. When you’ve done this, make a note of the Gmail address and password. I’ll be needing the Gmail address. I want to help you get set up on Google My Business which allows you to list your location on Google maps, collect reviews, set business hours and answer FAQs. 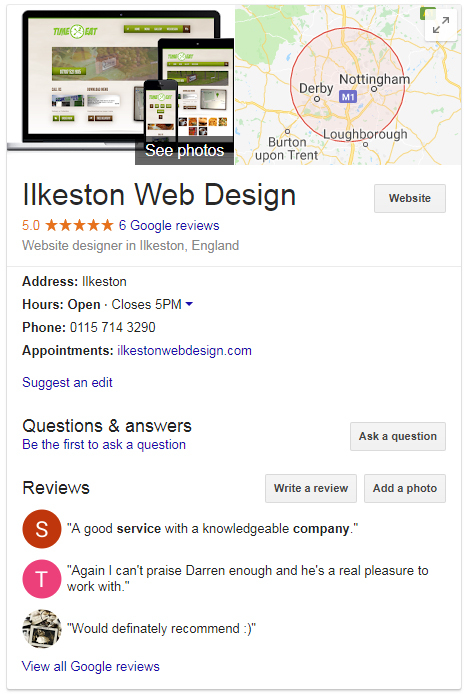 Having a Google My Business (or GMB for short) helps people find you on Google, especially where local services are concerned. I’ll need your business operating address. If you’re home-based and want to keep your address private, we can set up an operating area as opposed to a specific address. Alternatively, you could use a local virtual office address (it’s just a pigeon hole for your mail, which gets forwarded on to you). A fully set up GMB listing can make you seriously competitive and integrates with your website. Please don’t miss out on this. It’s a fantastic suite of tools and I absolutely insist that you have it. I’ll need your Google Gmail address so I can set up shared access for the both of us. 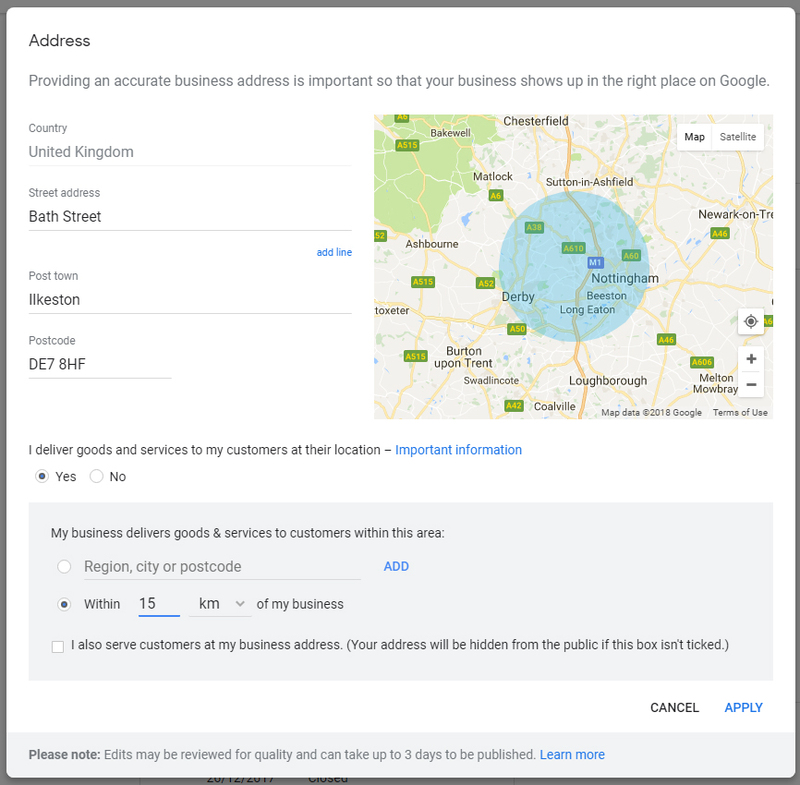 You’ll also need to provide a business operating address or phone number so Google, for verification reasons, can send a PIN either by post, phone or text message. The name of your business will typically be used for the website title. The website description is a short line of text summarising what the site is about, and is often displayed beneath the website logo or on the front page as a heading. Your description could be a mission statement or it could be a straightforward set of keywords that include the location you serve (this is important if the title doesn’t mention the location). Clever puns, jokes or a play on words should be avoided. Your website needs somewhere to “live” online. What it needs is a web host. You may already have one, you might not. If you’re having a website redesigned, this would be a good opportunity to jump ship to a better host. If your website is going to be serving a local area, the traffic is going to be low, relatively speaking, and so shared hosting will be perfectly adequate. I wholeheartedly recommend Dreamhost, which is an excellent value web host because they offer lots of extras (email, https) which other hosts charge individually for. Stay away from 123-Reg and GoDaddy for web-hosting, although the latter is fine for domain registration. You’ll need to sign up to Dreamhost on your own since you’ll be required to supply card payment info. Picking a domain (also known as URL or web address) is easier than you might think. Many domains are too long and too hard to remember. Aim to register a .co.uk or a .com or if you can afford it, both. Use .org.uk if you’re a charity or community interest company only. If you’ve already bought a domain elsewhere (as in not through Dreamhost) this is not a problem. It can be connected to your Dreamhost account. GoDaddy have some good deals on domains. You could also take a look at 123-Reg. Watch out for the small print: the renewals and VAT is where they get you! Tip: If you’re working from home and cannot let your address be known, use domain privacy where available in the URL registrations process. This is normally an additional annual fee. Ah yes, the security certificate. Now, you’re probably familiar with the padlock icon that appears to the left of the URL/web address bar at the top of your browser. There was a time when security certificates were the sole preserve of eCommerce sites (as in taking payments online) but the use of such things now extends to all websites, as advised by Google. Security certificates are around £50 a year with hosts like GoDaddy, or free for the most basic type with Dreamhost. Even the slightly more advanced Comodo https on Dreamhost – ideal for an eCommerce store – is something like $15 annually. Yes, that’s dollars. Assuming you want to run an email newsletter, now would be the right time to set up the newsletter account. Broadcast pre-written email messages to a list of subscribers that have opted in to receive them. Automatically broadcast email alerts to the subscribers when new blog content is published on the site. MailChimp is a free newsletter service that only starts charging after you get more than 2000 subscribers. This is an excellent, excellent service and I use it myself. To be honest, you might never go over 2000 subscribers or even come close. If you’re sceptical about the whole newsletter thing, let me just say it’s easier to get an email in someone’s inbox and have them read it than to rely on them seeing your posts on social media. And social media is getting harder to be seen unless you pay to boost. A mirror is something that helps speed up your website load time. I’ll be setting you up with a free Cloudflare account to this end. This is the part where we decide what pages might, should, could or would be needed, in what order, and how they connect to each other. In the course of our chat you might be getting ideas for pages that can be added that you’d never considered previously. A good business website should answer every possible question someone might have. It should address and satisfy concerns, overcome objections and build a sense of trustworthiness. 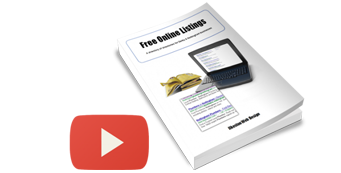 The more information you put on the website, the more likely you are to be found in search engines. You’re also less likely to spend time unnecessarily repeating yourself over the phone or in person. Many potential customers are very thorough and like to do their research, especially if they’re weighing you up against competitors. In terms of the structure, try to imagine “child” website pages nested under “parent” website pages, rather like a family tree. The basic idea is to group particular pages together in a logical, topical structure. The web pages will be organised into navigation bars on the website. A navigation bar is normally along the top of the website, on every page. Sometimes a website has two navigation bars – as in two rows of links/buttons. The first row of links is the primary navigation bar. The second row of links is the secondary navigation bar. 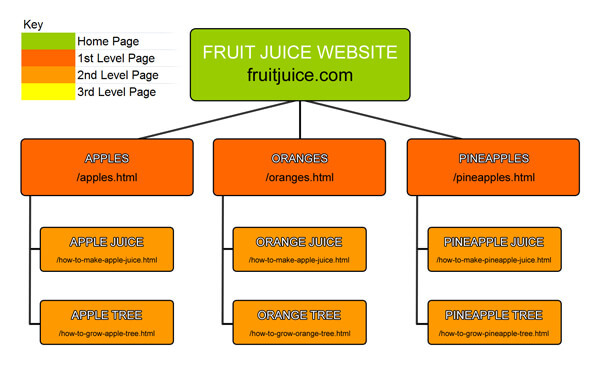 I’ll be setting up a spreadsheet to organise all the information concerning website and page structure in one place. Below is a video explaining the spreadsheet. If you don’t understand the concepts in the video, it doesn’t matter, as it’s meant more for me than you. By now we would have had some in-depth conversations about what pages (and subsequently, what content) could go on the site. “Wireframe” is another word for “rough sketch” by the way! In terms of pages and content, I will have given you food for thought, and you will have had some lightbulb moments after dwelling on it a little. We can sit down together with a notepad and pen and spend a few minutes drawing some diagrams (similar to the fruit juice one further up this page) and adding anything else to it.